America is closer than ever to energy independence. Last week, the U.S. became a net exporter of oil and petroleum products. The 11.7 million barrels pumped at the end of November makes the U.S. the world's largest crude producer. American exports now total 3.2 million barrels a day, an extraordinary number given that former President Obama lifted the ban on crude exports just three years ago. All of which raises the question: Has the boom in U.S. oil production contributed to the global rise in greenhouse gas levels? The short answer is yes, but by how much is a matter of some debate. Carbon emissions worldwide are rising — fast. The Global Carbon Project estimates international carbon dioxide levels increased 2.7 percent in 2018, following a 1.6 percent rise in 2017 (Climatewire, Dec. 6). Most energy analysts pin the world's rising emissions on increased economic growth, particularly in Southeast Asia, which has driven an across-the-board bump in the consumption of oil, coal and natural gas. Global oil demand, for instance, has risen from around 95 million barrels a day in 2015 to roughly 100 million barrels a day in 2018, according to figures from the International Energy Agency. But an argument can be made that increased American oil production has also stoked demand, said Daniel Raimi, a researcher at Resources for the Future, a Washington-based think tank. Increased American production has brought more oil onto the market, keeping prices low. "And because those prices are lower, it is encouraging additional consumption around the world," Raimi said. "To the extent additional consumption is because of additional U.S. production, then, yes, I think it is fair to say additional U.S. production has contributed to higher emissions globally." The debate contains echoes of 2015, when Congress struck a deal with Obama to lift the ban on foreign crude sales. U.S. oil production has climbed steadily higher since, despite wild swings in global crude prices. 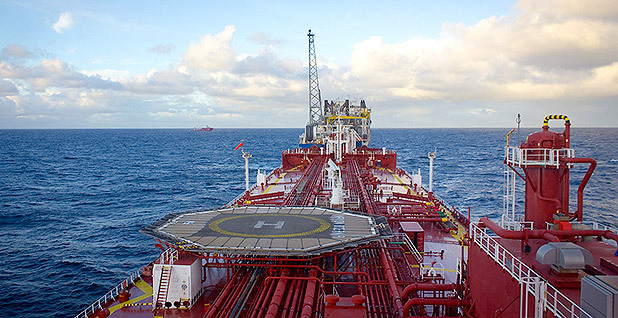 The U.S. became a net exporter of crude and petroleum products last week for the first time in decades, in large part due to strong sales of finished petroleum products (Energywire, Dec. 7). But America is still heavily reliant on foreign oil. The U.S. now consumes around 20 million barrels of oil a day, according to federal figures. It produces roughly 11.7 million barrels of crude a day and imports 7.2 million barrels per day. The situation owes itself to an oddity of America's oil market, said Deborah Gordon, director of the Carnegie Endowment for International Peace's climate and energy program. U.S. refineries are set up to process heavy crudes produced in countries like Canada, Mexico and Venezuela — not the light sweet brands pumped from Texas' Permian Basin or the Bakken in North Dakota. The result: America exports much of the oil it produces and consumes crude it buys from elsewhere. There is a climate cost to that dynamic. Imported crude generally has a higher carbon density than the American variety, Gordon said. Refineries expend more energy processing the foreign stuff. And they often use heavy crude to make other carbon-intense products like petroleum coke and bunker fuel. "We're giving away oil that is potentially much lower-emitting oil, and we're importing oil that is very carbon-intensive," Gordon said. "We're basically amping up the carbon cycle instead of using it for a real low-carbon transition strategy." Greater emphasis on methane mitigation at production sites combined with an overhaul of U.S. refineries to accept light crude would greatly reduce the carbon intensity of the American oil sector, she argues, helping ease the transition away from fossil fuels. Jason Bordoff, director of Columbia University's Center on Global Energy Policy, is skeptical that surging U.S. supply has greatly altered the world's emissions trajectory. The impact of America becoming an exporter on global greenhouse gas emissions depends on the market's long-term response to U.S. production. If new oil drilling in America prompts sustained low prices, that could stoke oil demand — and increase emissions. But that is a complicated analysis, Bordoff said. Global oil demand is sensitive to price changes, which can push consumption up or down. There's also this: Had the shale revolution not taken hold in the U.S., investment would likely have flowed elsewhere in the world. Other oil sources probably would have been tapped. The Organization of Petroleum Exporting Countries recently voted to cut production in a bid to bolster flagging crude prices. But OPEC was forced into that decision in part because of expanding supplies of U.S. oil. The organization might have made different decisions in a world where American shale producers exerted less influence, Bordoff said. That's not to downplay the seriousness of the problem, he said. The world needs to be making deep carbon reductions. It would be better to focus on technologies and government policies that cut demand, he said. Yet America's growing oil sector only makes that harder. Republicans once voiced support for transitioning away from oil on the grounds that importing so much foreign crude was a national security concern. "In certain circles, maybe not climate circles but more national security circles, the imperative to reduce oil use seems reduced because of perceptions that we have the supply that we need," Bordoff said.